One of the big stories this season is going to be the development of the youth the Rangers have invested so much time in. Players like Filip Chytil and Lias Andersson are expected to take on middle-six (or higher) roles with the club at the start of the season. Dark horses like Brett Howden, Ty Ronning, Ryan Lindgren, and Libor Hajek may also see extended time in New York. NHL time is always a critical step in a prospect’s development. In order to see what a kid has, he should be doing it at the NHL level. However that isn’t always the case, at least not right away. The dark horses are almost assuredly starting in the AHL, but the expectations of Chytil and Andersson shouldn’t cloud the most important thing: They need to develop properly, and there is no rush to do so. There is no shame in either of these kids spending time in the AHL. Sure, both have played well on the international stage, and in Chytil’s case the AHL as well. But what if they struggle in camp? It’s a legitimate scenario that the Rangers might face. In that scenario, AHL time might be best for both first round picks. There is no immediate need for them to be on the NHL roster. Even if it is just a month in the AHL to get accustomed to the rigors of North American hockey, it’s better than putting them in a situation to fail. The proper development is more important than seeing any prospect in the NHL. Good development means that when they hit the NHL, they will be ready and, more importantly, not be overwhelmed. Ensuring they can carry the load in the future is more important. "Developing players doesn't necessarily mean immediate NHL time", 3 out of 5 based on 18 ratings. Brooks said basically the same thing today, that it should not be assumed that the young guys will dominate the Ranger roster this season. If that’s the case, then I really do not know what the “plan” is. If it is to throw in the towel for this year to make a run in 2019-20, then the vets should have been gone already. But instead, the have gone the “mediocre” route for this year. Be bad enough to not make the playoffs, but good enough to not get a top 3 pick. Brilliant. My faith is starting to crack a little. Jeff (Gorton), talk me off the ledge. Plan A) Ice an experienced team with lots of middle six guys hoping for lightning in a bottle, a breakout year from one or two of them, overachieve and make a run with Hank in his, er, late prime. Let the kids grow mostly in the AHL — with periodic NHL time. Plan B) Ice an experienced team with lots of middle six guys who end up being exactly as mediocre as we think they are, but perhaps with one or four of them producing just enough to provide a return at the trade deadline. Bring up the kids. Rebuild continues. Tank by default post February in race to bottom. You may find an appeal in Lose for Hughes, but some of us don’t. I vastly prefer the results of last season to finishing dead last and getting the #1 overall pick. I have rooted for the Cubs for a long time. When Theo Epstein came in and traded away everyone and the Cubs became absolutely pitiful, I tuned out. Yes, I came back when things got better, though not quite as fervently. I still rate the NL East title in 1984 above the 2016 World Series. And who knows what would have happened if they did not achieve great success – and most teams don’t. Now I don’t matter – don’t even live in NY and the only place I’ve ever seen the Rangers play is Dallas – and you do, BUT I can’t help but think a lot of fans (less fervent than those that post on blogs) think like I do in this respect. Hence the position of trying to be as good as possible while not doing anything that compromises the future seems a reasonable one. JG actually wants to make the playoffs, just won’t compromise the future to do it. And so perhaps mediocrity – which is more to fun to watch than embarrassing is. Patience is a hard thing, but these kids will need some. They are better off playing big minutes in Hartford than limited time in the NHL. We have assets to move also to make room. I think mid season call ups are most likely for a lot of these kids. Considering the expectation is a lost season there’s not much benefit to rushing these kids. We have not talked much about Kravtsov, but we could see him late this year too after the KHL season. Would not be surprised if he played in Hartford first to get adjusted. Baptism by fire. Let the kids learn at the NHL level even if it takes 2 years. If they are good enough, they will blossom, if they don’t get ready for some rough years. I believe that we have some good kids, not great kids. If they were great, they wouldn’t have finished last at Traverse. These kids are all complimentary pieces, while we are being sold that they are (some anyway) top line players – they are not. We will need to use these guys as middle 6 guys who show effort and poise, but do not expect 30 goals, it just ain’t happening. This is why Hayes took the 1 year deal. He knows we need his talent, as a successor just isn’t ready. We didn’t play our top 4 prospects in the last game of Traverse…. Let’s not overweight a tournament to rate how good our prospects are here. Baptism by fire is how you destroy confidence, in a league and profession where confidence is everything. Keep in mind our top 4 prospects at the tournament didn’t play in 25% of the games that “we came in last place in”. The tournament standings are absolutely not an indicator of future success, you’ve fallen victim to small sample size. And even if we didn’t want to talk about small sample sizes, Chytil and Howden looked dominant. Success by fire is how you destroy confidence in a game and profession where confidence is absolutely everything. Ask Buchnevich about having no confidence last year, development is an individual process. Some players need to be coddled, some needed to be thrown into the fire because they thrive on the challenge. It’s not an all inclusive process. Either you have strong intestinal fortitude or you don’t. We need to stop babying players and let them play. I do not expect success in year 1, but I expect progress. We do not have a top 2 pick, therefore, we do not have a NHL ready stud. Are these guys NHL players, yes. Should we look at them as saviors, no. I disagree, respectfully with the intestinal fortitude comment. Especially with players coming over from Russia. Tarasenko had 19 points in 38 games his first year, 43 in 64 games his second year. He didn’t show up and be a super star, it took development. I don’t bring up Tarasenko as a direct comparision to Buchnevich, just more of a “it takes time” mentality. Lack of inherent intestinal fortitude, which to be honest I’m not even sure what that means, can be overcome with confidence. The “maybe I’m not good enough” mentality that comes with forcing guys who aren’t ready, into the NHL, destroys entire careers. I do however, agree that none of our current prospects are “saviors”, but if by savior you imply McDavid/Crosby level talent, those aren’t exactly easy to find. Buchnevich is 23, which is physical maturity. They published the camp roster(before the big boys did medicals) and I’m hoping his stats aren’t from this year because Chytil(who did weigh in before the roster was published) has 16 lbs on him and is 4 years younger. Those are your three top points producers in the NHL last season. Not exactly tanks. ¯\_(ツ)_/¯ Don’t know when those measurements come from, but they are from NHL.com so I would tend to assume last year. I’m personally more concerned with his skill being developed outside the games and maximized during the games – which he was not placed in a good spot for at times with the prior coaching regime, of course – than I am with his weight increasing. I am so confused as to why height and weight matter at all. Especially comparing two players with entirely different styles, and positions, in Buch and Chytil. It’s weight in relationship to height that’s the issue. If you think that Buchnevich and the players you mentioned are in the same ballpark in any measure of skill, I have a bridge for sale that you might be interested in. Even a dim bulb like you should be able to notice which one is not like the others. 3 skaters in the top 40 scorers are over 100 in a cm-kg measurement, Panarin being 1 of them. 1 player is at 100. The rest are mostly 5 under or more. So not only is Buchnevich’s skill not good enough to be a top 40 scorer being underweight, if his index is over 100 he may never be strong enough to express what skill he has. I’m still working under the assumption that what they listed for the camp roster is old data for the latter part. Ah yes when in doubt, resort to name calling. Even a bright LED bulb like yourself should consider comparing Buchnevich to players of similar output, and not arguably three best players in the world. I am also not interested in purchasing your bridge. Doesn’t seem like a great investment. Who’s in shape, you or your cousin? If you bought my bridge and patrolled it regularly, maybe you could weigh as much as your cousin and post less often here. EY OHHH WE GOT A KEYBOARD WARRIOR ALERT!!!!! You should’ve let me answer first who weighs more. Because your second point has been rendered obsolete, as he in fact weighs more than I do. So patrolling your bridge wouldn’t help me get closer to my cousin in weight. Nice of you to keep your response names inconsistent because you’re so hot to respond. Maybe I can sell the bridge to your cousin to get him away from the video games and he can start charging a toll to hire you to monitor his bridge patrols. My apologies, I got so excited I forgot the 94, glad you were able to figure it out though. Few questions. Where is the bridge located? Where would you like to start the bidding? Have all permits for public use been obtained? My whole point – which I thought was stated pretty clearly – is that skill and deployment will affect Buch’s performance far more than tacking on five extra pounds to satisfy Reen’s Super Special Magical Height-To-Weight Ratio Requirement For NHL Success™. The point was not at all that those four guys are all in the same skill tier. The point was, as stated, again, none of those guys are tanks. I guarantee you Connor McDavid would not turn into a 40 point player if he got his index up to 101 anymore than Buch would become a PPG player if he got his gap down to 98. One could also make a big list of players that are right in your wheelhouse range for this comparison you are infatuated with, and are not good hockey players at all at the NHL level. That’s because it doesn’t actually matter to NHL success so much as it rather reflects that there is indeed a large amount of humans who fit in an “average build” height/weight relationship category in the NHL…just like the general population! Imagine that. Egelstein I’m with you 100%. Skill and deployment (and in Buch’s particular case, general development/confidence), will decide if he’s a 50-60 point guy, or a 70-80+ point guy. You can believe whatever you want, but the data would tell you you’re wrong 8 days a week. This data won’t tell me anything other than: “Most quality NHL players are in this range, because most NHL players are in this range, period… but some aren’t.” LOL. It is not the Holy Grail. If it was, every scout in the world would only need a BMI chart to assess if a player could ever possibly make it to the NHL or not. When I was wrestling in what would’ve been my draft year, I went from 175cm/85kg football weight down to 175/71 when I had to seriously had to cut weight for a match to a 175/77 walking around weight. Now I was an outlier because my legs could squat the universal stack at 17, so that might be 5kg of mass on my legs that most guys my size didn’t have. cm and kg mean literally nothing to me. Nor does your HS sport statistics. I can’t go through my life worrying about shitheads like you. If you can’t figure it out by now, not much I can do for you. You know that the players you lionized played all the games that got them to the last place to begin with. So if you think these games matter or that Howden or Chytil were dominant, you’re out of your mind. Developing players can be done in the AHL or also in the NHL depending on the player. Each player is unique. Hopefully Gorton and Quinn know a lot more than we do in this area. 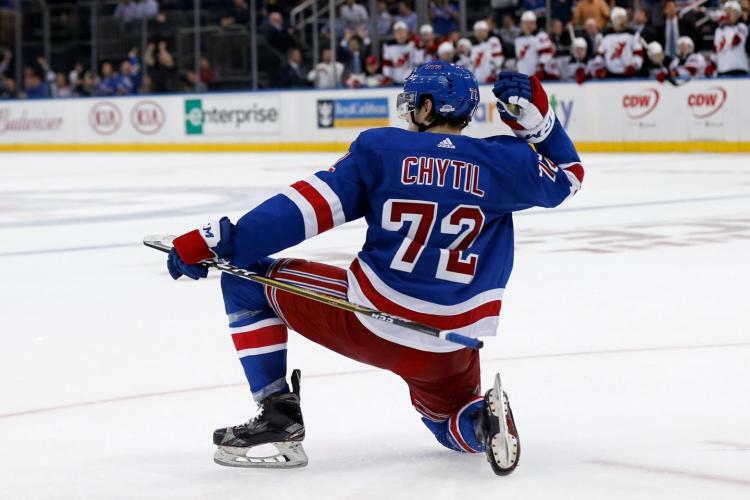 Chytil just turned 19. Andersson will turn 20 in October and Howden will turn 21 in March. These are all young players. Although there are guys like Connor McDavid, Auston Matthews, Patrik Laine and Wayne Gretzky who are so overwhelmingly talented that they break in and dominate at such an age, that is a rare event. I think the Rangers intend to play Chytil and Andersson or Howden this season from the outset. But if any of them spend time in Hartford I would not look at that as a negative considering their ages. They are still developing physically and even their brain development is not 100% complete. Yeah Chytil and Andersson were never going to be those kind of kids. They needed to refine their games in the AHL and most likely 2 out of the 3 rookie wipl need more time down there. Chytil should make the most out of his 3c role. Brassard came up the ranks through that way and same goes for Hayes. Stop talking age and let’stalk talent. We THINK we have talent in Chytil, Andersson and Howden. Let’s forget their age and see if they have real NHL quality. Guys have it at 19, 20 and 21,so being young doesn’t stop them from being good. I have read “What good is a youth movement if you don’t play the youth”? Fair question, but my take is a bit different. A youth movement doesn’t necessarily mean the kids should be forced into playing on the Rangers regardless if they are ready or not. The Rangers have been guilty of that practice far too long. We are rebuilding, that in itself should allow our young talent to develop in the minors and not be rushed here just because. If one looks at Pittsburg, I know, I know, I hate them as well. However, there is no getting away from the fact they are a) successful and b) allow their talent to develop in the minors. Sure they have the luxury of a star studded line-up, I get that. We are rebuilding. I for one do not give a damn about this years record. All I care to see is a hard working team. Consistent effort, not only night after night but shift after shift. What is also important is developing the youth we acquired and are yet to acquire, the RIGHT way. A complete NY Ranger philosophical change. Gone should be the days of AV’s idiotic vets deserve ice time just because they are vets. No one regardless of time in the NHL should be guaranteed ice time, and to go a step further, during a rebuild, they shouldn’t even be guaranteed a roster spot. Lets have patience and let the process work. Let’s bring up a kid when he’s ready and not before. We have nothing to prove this year and so we should not be disappointed if a kid stay with the Pack, or his Junior Team, or in College, or Europe as long as he develops, you get the picture. I have been a Ranger fan for a very long time, as have many others on here. I’m 100% behind this rebuild, and I am just as excited as well. Amen Dave. Things are complicated. NHL experience isn’t necessarily better than AHL experience, it’s different. If you want someone to play first line, it may be better for them to play first line in Hartford than fourth line in NY. If you have a good young defenseman that would get embarrassed on the PK in the NHL, giving him PK experience in Hartford is a good thing. And indeed, if you have to shelter a player in NY, there is a lot he isn’t getting. When it comes to developing young hockey player, I believe it’s important that they excel at one level before they are moved up to the next. Sitting in the pressbox or getting limited icetime in the big leagues is not going to make a hockey player better. They are just going to get rusty and lose their confidence. Jake Dotchin was placed on waivers…I would claim him ASAP! Not so fast, the young man was a healthy scratch frequently for TB at the end of the year last year and didn’t play in the playoffs. They were seeking termination of his contract for a ‘materia breach’ which sources were saying was conditioning issues. That seems to be an ongoing theme. I’d be rather cautious. Let them play and also let them know 2018/19 is a learning year.The AHL,for the Rangers anyway, hasn’t produced. The AHL has produced for the Rangers – and it must. Guys like Michael Sauer and Ryan McDonagh became stellar defense learning in the AHL. If it isn’t working, they just need better coaches. They did overhaul I believe after the 2016-2017 season. The team actually got a lot better during the season last year and some players – Georgiev and Gilmour at least – clearly progressed. Yeah but after Mcd and Sauer AHL era, Fast was the only one to make a long term impact with the big club. I forgot what year that they had a good team that made the playoffs. 2012? 2013? Maybe 2014? At the time JT Miller was the top line center and Mcllrath still had the hype that he was the truth and a future top 4 D man. It’s been a minute since the AHL team developed a quality player who made them that much better while they played for them. Pionk was a different kind of story. Hayes didn’t need to learn how to be a NHL centerman down there and Vesey also skipped his AHL conditioning stint. That made the AHL take a major hit in having a established culture down there between 2014 and now. It’s been nothing but poor regular season records and no playoffs in between that time frame. They should experiment for putting someone like Lias Andersson on the wing. His nickname was Swiss army knife for that very reason. If the Ducks could do that to Rackell who is loads better than him than I see no problem for the Rangers rookies to play on someone’s flank. I could have the exact date wrong, but weren’t Maple Leaf Fans tossing jerseys on the Ice on 2014-15 season? Proper development requires nhl time and a coaches ability to let them learn and make mistakes and correct them. If anything has been learned it’s that the ahl will help if you don’t quite have nhl skills yet. The past has shown me many thing and among them is you can’t send everyone down and have them develop. Did Andersson and chytil need ahl time. I say no. They could have been inserted into the lineup to go. This whole philosophy needs to change as the coach has changed AV was not patient and knew he would not give hem the attention they needed if they stayed up. Will Quinn be the same way? I have no expectation of a winning season this year. I would prefer to see young players get nhl time on a consistent basis. I’m not saying run a Baby squad but you gotta call people up and play them. I give Quinn 2 years and then he should be rolling. In the meantime enjoy the show.